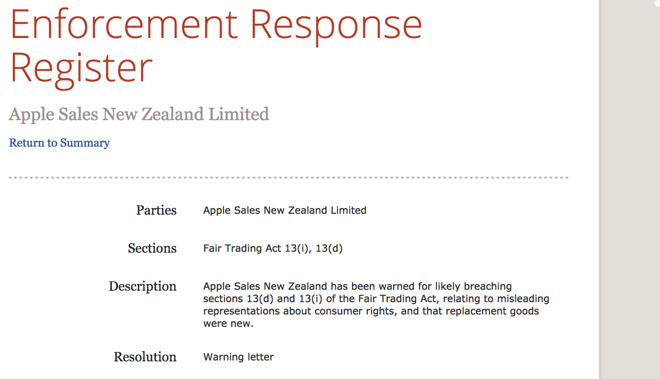 New Zealand's Commerce Commission has issued an eight-page warning to Apple alleging that the company breached that country's Consumer Guarantees Act and Fair Trading Act. According to an account by the NZ Herald, the commission is arguing that Apple, through Apple Sales New Zealand, circumvented that law by "telling consumers that its products are covered by a guarantee for two years, and for referring them to the manufacturer of non-Apple branded products, excluding Apple's liability for certain products." Commissioner Anna Rawlings noted the Consumer Guarantees Act does not specify such predetermined expiry periods or other requirements. The letter is the result of around two years of complaints regarding terms and conditions tied to purchases, as well as repairs and replacements of faulty products. Another point of contention is Apple's responsibility for third-party products sold through its online store. "We consider that Apple is likely to be misleading consumers by trying to exclude its liability for non-Apple branded products, the letter said. "If this behaviour is continuing, we recommend you take immediate action to address our concerns and seek legal advice about complying with the Fair Trading Act." Apple cooperated with the investigation and made changes to conform with the commission's findings. For example, Apple employees are now aware that consumer rights laws are not bound by time, the agency said. The company has long operated in New Zealand. It activated Apple Pay last October and AppleCare and Mac warrantees in January, at the same time that Australia gained access to the same services.